Elasticsearch, Fluentd, and Kibana (EFK) allow you to collect, index, search, and visualize log data. This is a great alternative to the proprietary software Splunk, which lets you get started for free, but requires a paid license once the data volume increases. This tutorial shows you how to build a log solution using three open source software components: Elasticsearch, Fluentd and Kibana. Elasticsearch requires Java, so the first step is to install Java. 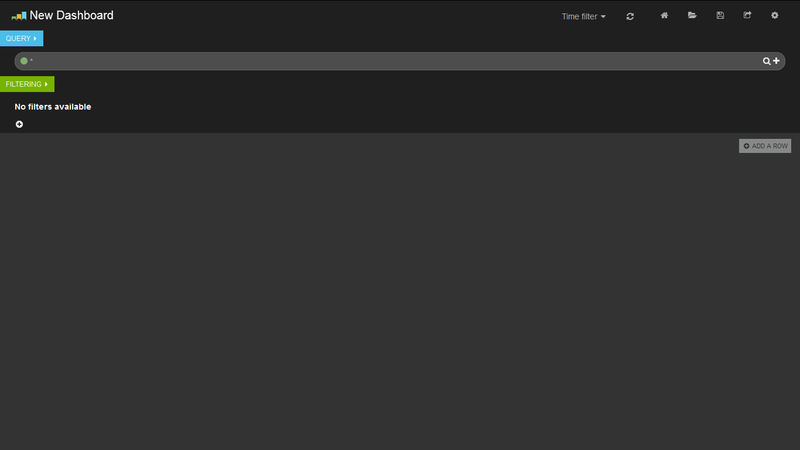 Next, download and install Elasticsearch's deb package as follows. Start running Elasticsearch with the following command. Since Kibana will use port 80 to talk to Elasticsearch as opposed to the default port 9200, Kibana's config.js must be updated. We will use Nginx as a proxy server to allow access to the dashboard from the Public Internet (with basic authentication). Kibana provides a good default nginx.conf, which we will modify slightly. Note: The original file is from this Kibana GitHub repository. Now, you should be able to see the generic Kibana dashboard at your server's IP address or domain, using your favorite browser. Finally, let's install Fluentd. We will use td-agent, the packaged version of Fluentd, built and maintained by Treasure Data. out_elasticsearch: this plugin lets Fluentd to stream data to Elasticsearch. 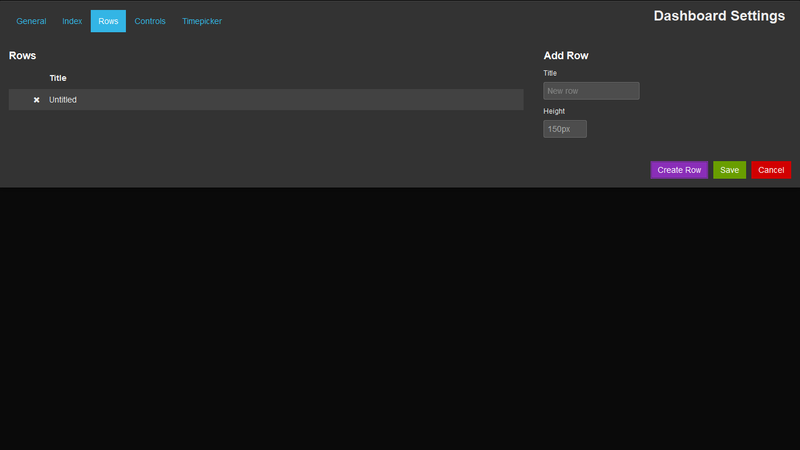 outrecordreformer: this plugin lets us process data into a more useful format. Ubuntu 14.04 ships with rsyslogd. It needs to be reconfigured to forward syslog events to the port Fluentd listens to (port 5140 in this example). Kibana's default panels are very generic, so it's recommended to customize them. Here, we show two methods. Note: The original configuration file is from the author's GitHub gist. If you refresh your Kibana dashboard home page at your server's URL, Kibana should now be configured to show histograms by syslog severity and facility, as well as recent log lines in a table. Go to your server's IP address or domain to view the Kibana dashboard. There are a couple of starter templates, but let's choose the blank one called Blank Dashboard: I'm comfortable configuring on my own, shown at the bottom of the welcome text. Next, click on the + ADD A ROW button on the right side of the dashboard. A configuration screen for a new row (a row consists of one or more panels) should show up. Enter a title, press the Create Row button, followed by Save. This creates a row. 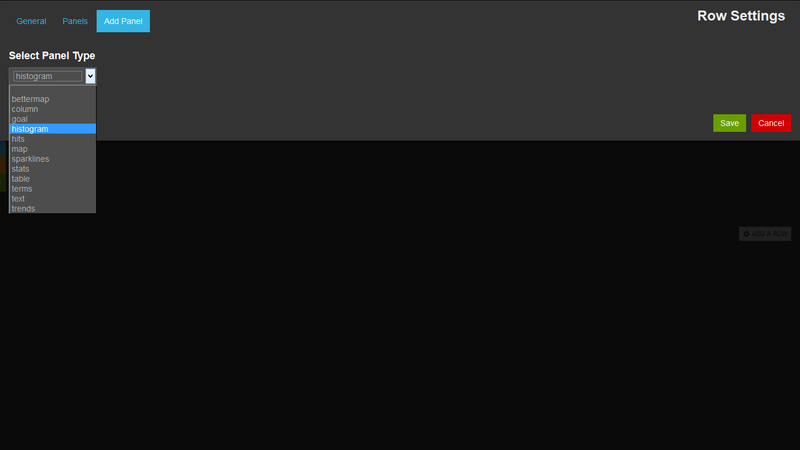 When an empty row is created, Kibana shows the prompt Add panel to empty row on the left. Click this button. 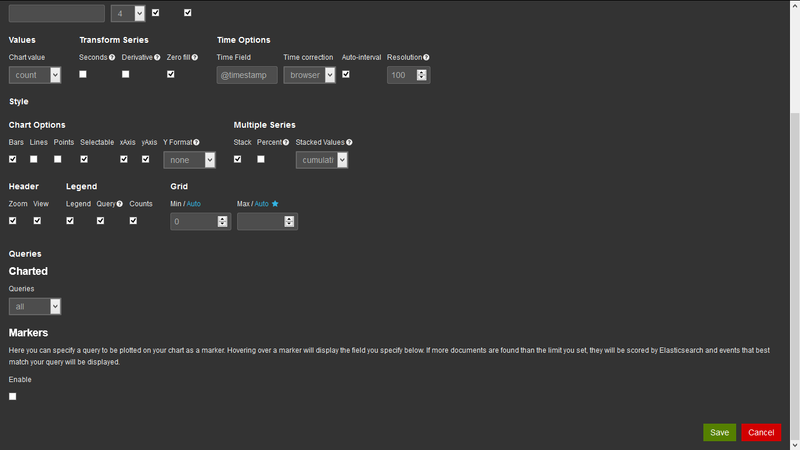 It takes you to the configuration screen to add a new panel. Choose histogram from the dropdown menu. A histogram is a time chart; for more information, see Kibana's documentation. There are many parameters to configure for a new histogram, but you can just scroll down and press the Save button. This creates a new panel. 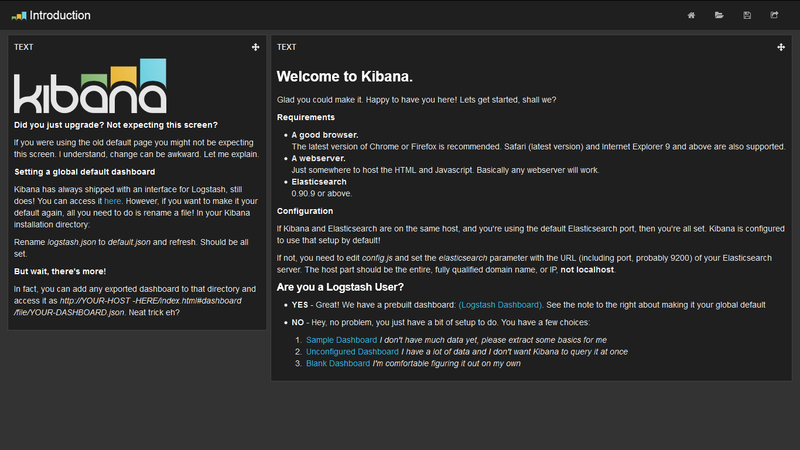 For further information about configuring Kibana, please see the Kibana documentation page.